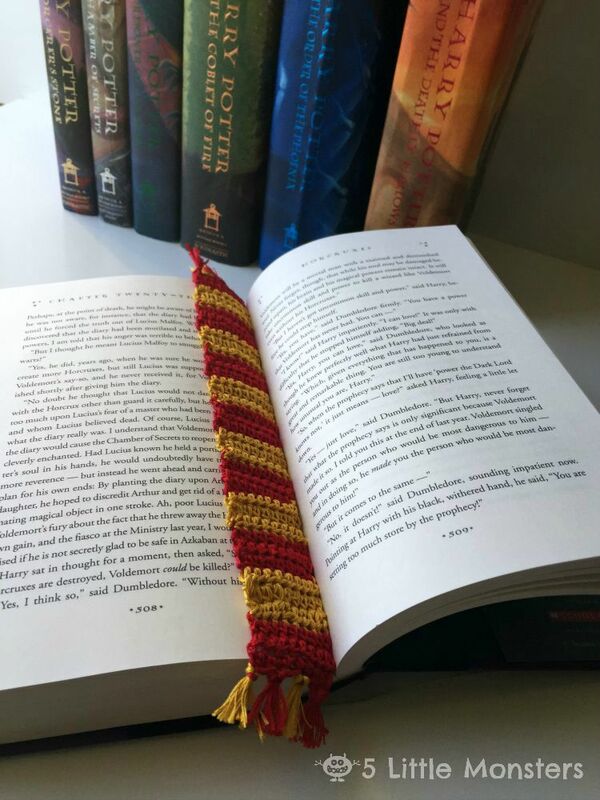 For my Harry Potter themed project today I decided to crochet some bookmarks that look like the house scarves in the movies. There are two different styles in the movies the ones with all wide stripes and the ones with the thin stripes in the contrasting color. I decided to make one in each style. I also decided to go with the movie colors for Ravenclaw rather than the book colors just because I like them better. I made the bookmarks to fit the hardcover books but you could easily shorten it to fit better in the paperback versions. 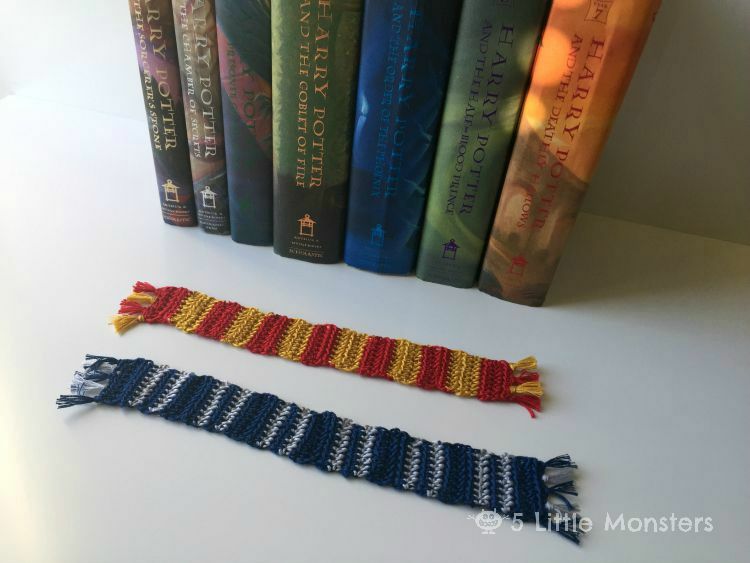 I knew that I wanted to use thread rather than yarn to make my bookmarks because I wanted them to be relatively thin, but I also didn't want to buy a giant ball of crochet thread in each color, if I could even find each of the colors. So I decided to make them using embroidery floss. It is cheap and comes in tons of colors so you can find any color you are looking for. Just a word of warning, although these are really easy there are quite a few ends to weave in on this project so be prepared for that. I used 2 skeins of each color for the wide stripe scarf and 2 blue and one gray for the thin striped scarf, however, that was barely enough so if you leave your ends any longer than I did you will need more so you might want to buy extra just in case. 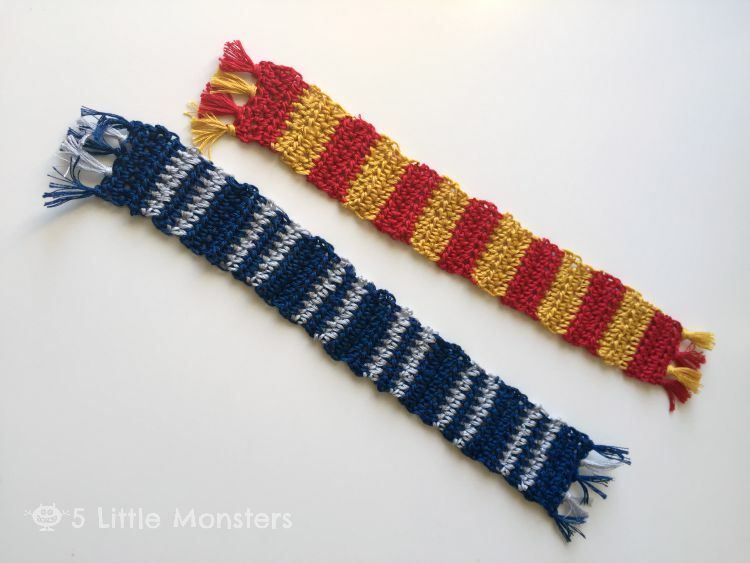 Continue this pattern, three rows of each color, until your bookmark is the desired length. I started and ended with red and had a total of 7 red sections and 6 gold sections. Weave in all ends. Cut lengths of thread about 6-8 inches long (you need them long enough to work with, you can trim them later. 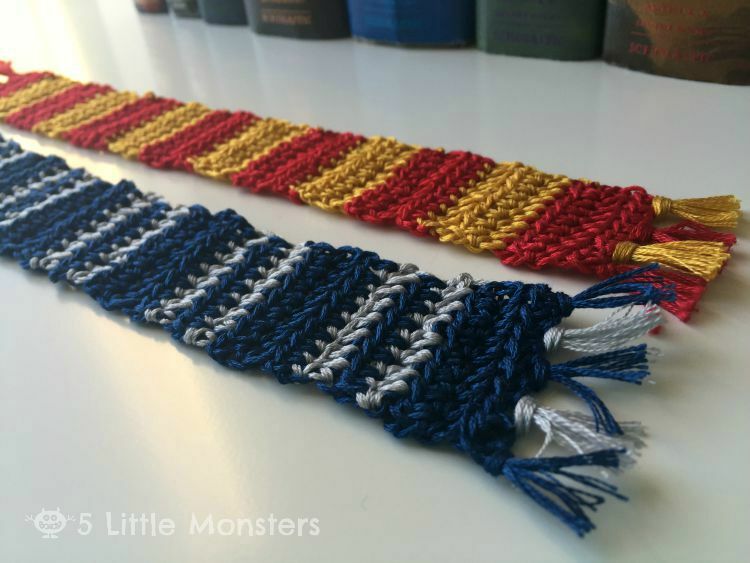 You will need 4-6 of each color depending on how many tassel you want. On one scarf I added 4 tassels on each end, on the other I added 5, I liked 5 better. For 4 you just need 4 of each color, for 5 you need 4 of one color and 6 of the other. Attach the tassels by folding your thread in half, then stick your hook through the end where you want to attach the tassel, grab the middle of your folded thread and pull through until you have a little loop (this will fold it in half again), stick your hook through the loop you just created and pull the loose end through, pull to tighten. Repeat to attach all tassels, then trim to make even. 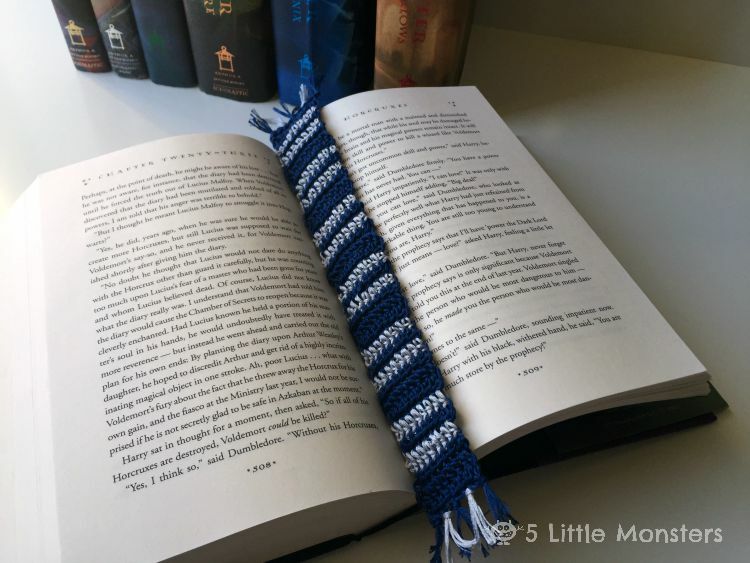 Continue this pattern, three rows of one color, three thin rows alternating color, until your bookmark is the desired length. I started and ended with three rows of blue and had a total of 7 blue sections and 6 gray/blue/gray sections. Attach tassels the same way as the thick stripe version. 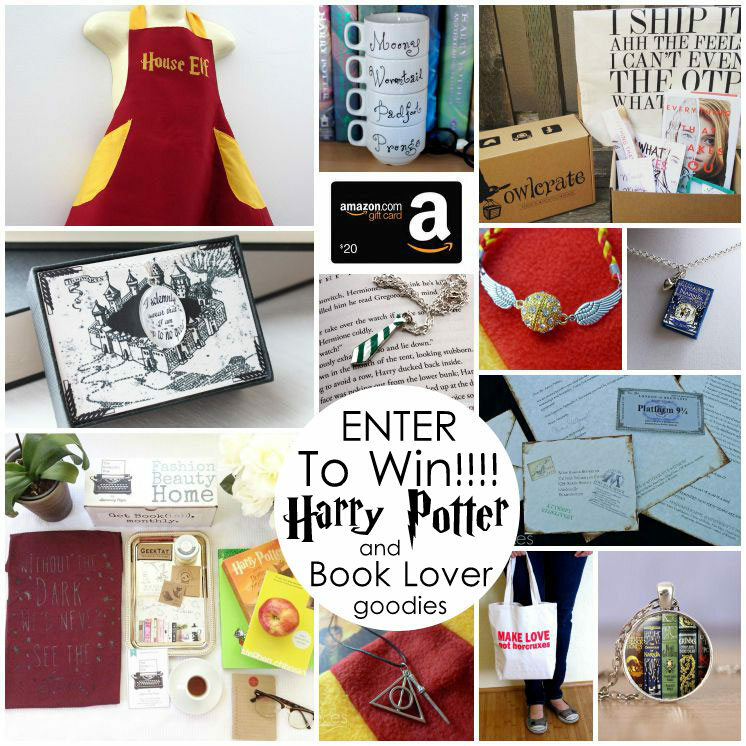 Be sure to head over to Rae Gun Ramblings to check out all of the other Harry Potter ideas people are sharing this week and enter an awesome giveaway. I love this project! I have a gift card to JoAnns that I need to use, so I'm going to get some embroidery floss! My daughters will love these if I surprise them. Our whole family is reading the different books (1,2,3, &6). 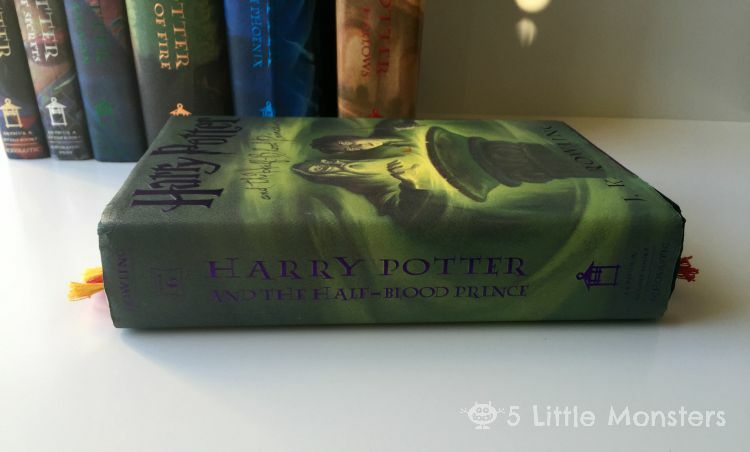 Perfect for the Harry Potter fan! 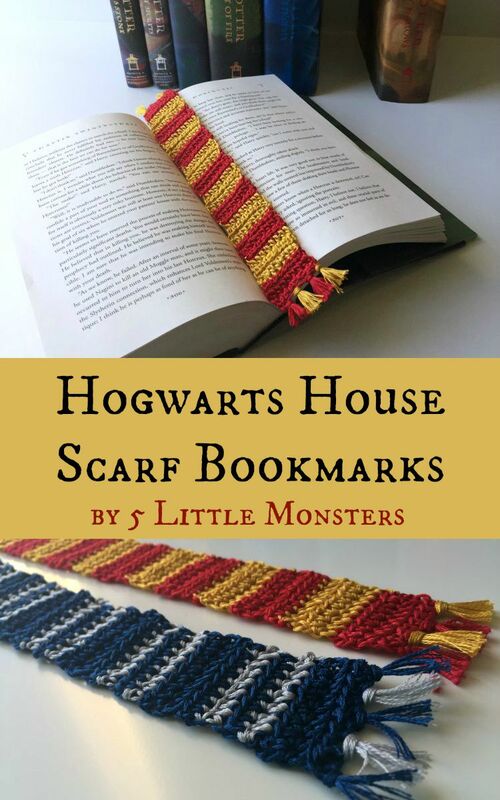 These bookmarks are just adorable. I love these sooooooo much. Might have to be my first crochet project! I am new to crochet & would love to make this but I'm having difficulties with how thin & slippery the embroidery floss is. Do you have any tips? Even making my initial chain was difficult because it's so thin and hard to see. I'm trying to surprise my husband with this as a gift so any tips would be appreciated! The embroidery floss is a little difficult to work with because it can be a little slippery and it is 6 strands together. Another option would be to try using cotton crochet thread or perle cotton. I just chose embroidery floss because it is cheap, easy to find, and available in lots of colors but it is probably the hardest to work with.